1:1 scale digital print on 150 metre Billboard. Commissioned by the Institute of Contemporary Interdisciplinary Arts for the University of Bath, UK. Can hundreds people come together in harmony, work as a team, dream the same dream? 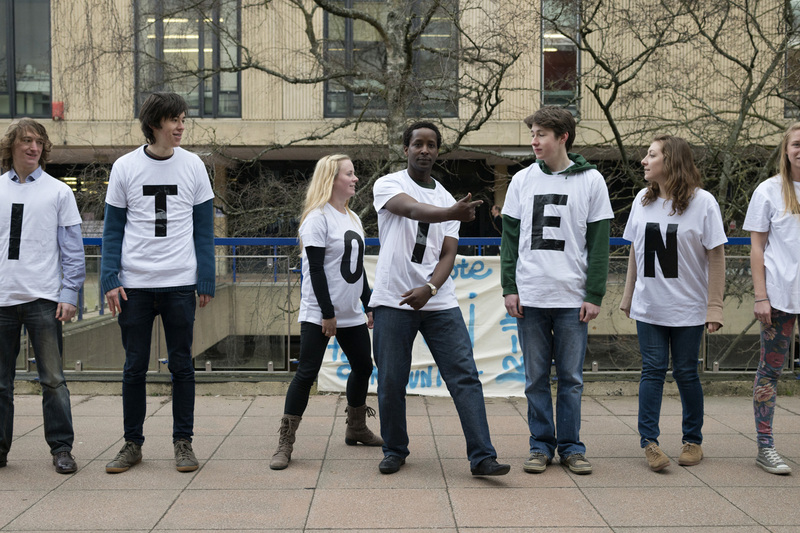 When 120 students from the University of Bath gathered on 13 March 2013, wearing a T-shirt with a letter printed on, they were asked to try and position themselves in a way that made sense. Could they ever become the utopian sentence hidden between themselves? The resulting 60 meter photograph printed on hoardings around the newly build ICIA gallery reflects on this impossible ideal by showing the sentence deconstructed, broken by people positioned in the wrong place, facing the wrong way or jumping around having a laugh.